Italian act XP8 composes an airy blend of EBM, electronica, techno and trance, bringing various visions and talents to life with synthetic vibrancy and danceable beats, aimed at the heart of the dance floor. After finding an audience with the 2004 release Forgive[n], XP8 truly gained worldwide attention with the follow-up albums Hrs:Min:Sec and 2008's brilliant The Art Of Revenge, both released by the German label Infacted Recordings. 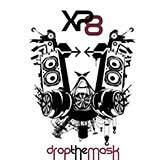 Now, for 2010, XP8 joins Metropolis Records to release the much anticipated new album, entitled Drop The Mask. A further evolution of the band's sound, Drop the Mask shows the duo of Marco Visconti and Marko Resurreccion taking their collective music prowess to new heights. Still present are the subtle hints of the 1980s and early influences, while slipping easily into sounds of the new millennium: glitchy patterns, sharp simulated strings, and clear vocals travel through bright sequences and brooding atmospheres. With Drop The Mask, XP8 has pushed themselves harder and farther than they have previously gone, and it shows.